← What is PsychoNephrology? Interview with Kidney MD . . .
Our attention span for watching videos has changed – it’s very low these days. So for me to suggest you watch a video over 30 minutes long . . . you know there has to be some real value here. Dave deBronkart, also known as e-Patient Dave. 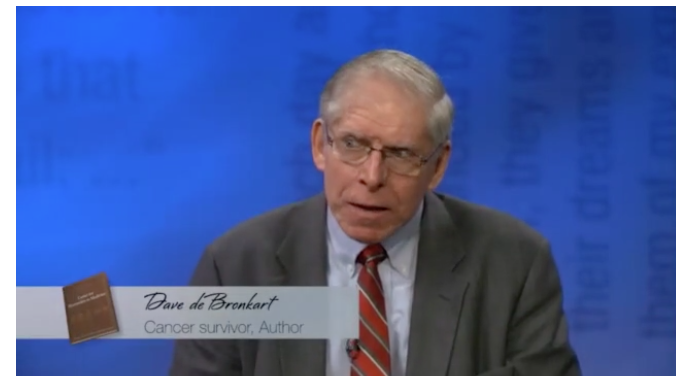 This interview is between Dave deBronkart for the Mayo Clinic’s “Healing Words” program for their in-patient TV channel, produced by Mayo’s Dolores Jean Lavins Center for Humanities in Medicine. Here is a link to the actual interview: http://www.epatientdave.com/2015/04/30/mayos-healing-words-program-reading-from-facing-death-with-hope/ It is so worth the time. I was moved to tears watching this interview. There were so many points that touched me as a person living with chronic illnesses. Here are a few points that I came away with after watching the video. Managing negativing thinking when dealing with illness is very important. It frees one to be effective in order to do the things that are really important at that time. Laughing improves health. Laughter is a way to manage negative thinking while dealing with an illness. Laughter may have it’s own power to make us better that we do not yet fully understand with our current level of science. Doing as much (in life) as you did before you were diagnosed, with your illness, signals to your body not to start shutting down. If you do less (activity) your body will shut down taking your activity level as a sign that you’re dying. We set the tone with friends and family about how to treat us with our illness. They learn from us how to react. Consider writing a letter to your disease . . . or diseases. Closing quote . . . Here is a link to the book that encapsulates some of what he spoke about. Here is a link to Mr. deBronkart’s other books. Including, Laugh, Sing and Eat like a Pig. This entry was posted in Amazing People, Message, Uncategorized and tagged advocacy, advocate, author, Blog, blogger, books, cancer surviver, chronic illness, Chronic Kidney Disease, Dave deBronkart, diagnosis, Dolores Jean Lavins Center for Humanities in Medicine, e-Patient Dave, Facing Death with Hope, Healing Words, in-patient TV channel, Inspiration, interview, keynote speaker, kidney cancer, Laugh Sing and Eat Like Pig, laughter, laughter as medicine, Let Patients Help, letter to your disease, Mayo Clinic, message, negative thinking, patient engagement advocate, quality of life, react, science, set the tone, speaker, value, video, words of wisdom. Bookmark the permalink. 1 Response to Messages from a Powerful Interview with e-Patient Dave . . .